U 7.21-4: Grossbooted draymen rolled barrels dullthudding out of Prince's stores and bumped them up on the brewery float. On the brewery float bumped dullthudding barrels rolled by grossbooted draymen out of Prince's stores. Commentators inform us confidently that the location of Prince’s stores is a warehouse at No 13 North Prince’s Street, but they are wrong. Little could Joyce and his fellow-citizens have foreseen that the location and name of what used to be a social landmark in the very centre of the metropolis could be forgotten just a few decades later. In Mr Deasy’s words: “It seems history is to blame”. To be more precise the Rising of Easter Week 1916. A Select Smoking Room Attached. [… ] one of the best situated seven-day retail licensed concerns in the city, facing the General Post office. There is a fine, long Drinking Bar, beautifully fitted with mahogany and walnut embellishments, bevelled mirrored plate-glass panelling; large, comfortable Snug, with side entrance; and a Private Luncheon Bar at the end of shop. The fittings are in perfect order. Six-pull porter-machine, gasaliers, window gas bars, neatly inserted spiral cellarage, ample dwelling, accommodation, etc. The dullthudding barrels would have come up from the “very commodious and dry [cellarage], extending under arched vaults beneath Prince’s street” (Freeman’s Journal, 4 June 1891). at the entrance of Prince's Street, a cul-de-sac. At that time the Hotel Metropole occupied Nos 1 and 2 North Prince’s Street and Prince’s Stores was at No 3. The warehouse at No 13 identified by Gifford and others is further down the cul-de-sac near William’s Lane and irrelevant to the action of Ulysses. The shaded areas show buildings destroyed during the Easter Rising. The Prince’s Stores can be seen between the Hotel Metropole and the Freeman’s Offices. The Prince's Stores and the offices of the Freeman's Journal destroyed during the Rising. The destruction of the whole block of buildings between Prince’s Street and Middle Abbey Street during April 1916 almost completely erased the memory of a once-famous haunt for journalists, the staff of firms like Eason’s and Thom’s, as well as those employed in the GPO opposite. 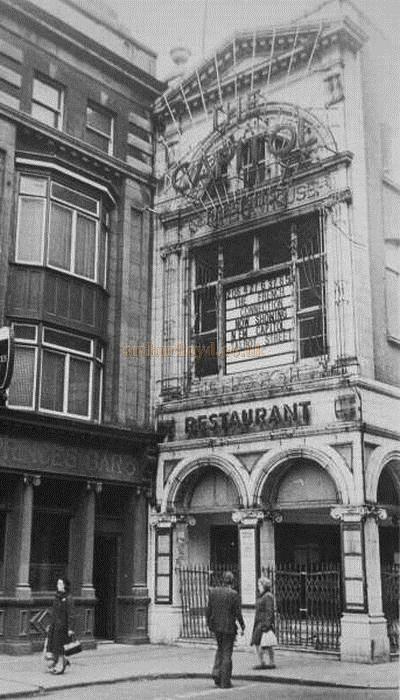 The premises were rebuilt in 1919 and lasted for another fifty years as Prince’s Bar until they were finally demolished along with the Metropole and Capitol Cinemas in 1972.